The Essential Rose is one of 10 new titles in our line up this year. The International Herb Association chose the Rose as Herb of the Year™ 2012. 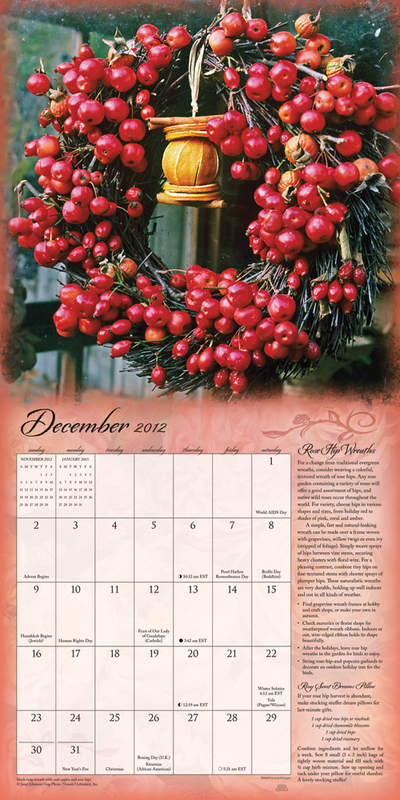 The Essential Rose wall calendar is artfully crafted by writer and renowned gardener Ann Lovejoy. Beautiful, fragrant and delicious, roses have been a floral favorite for thousands of years. Most often associated with passion, love and beauty, roses are also one of the oldest known medicinal plants and are valued for culinary uses around the globe. Stunning photography combined with recipes and tips on cultivation, crafts and herbal remedies will enchant you all year long. This entry was posted in Holiday Lore, Kitchen & Gardening and tagged recipe on August 16, 2011 by Amber Lotus Publishing.